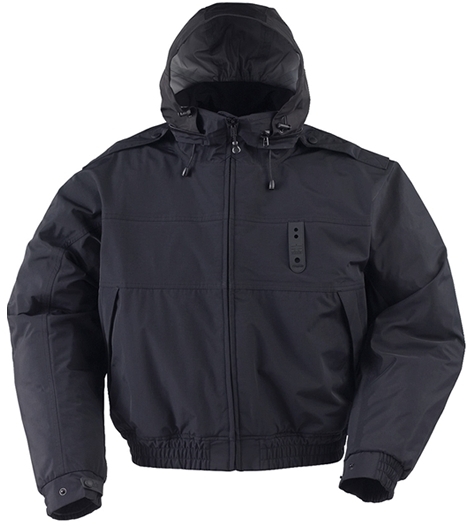 The Bravo Jacket is a full cut, short-waist length model (25” center back length measured from the neckline to the bottom of the back hem, size Large) with a premium zip-out quilted, insulated liner, zipper front and elasticized waistband. The jacket’s Nylon shell fabric has a waterproof/breathable laminate barrier throughout the body, sleeves, collar and hood, and is fully factory seam-sealed. The jacket’s shell is constructed from a military-inspired 3-layer fabric laminate. Includes removable, fleece-lined, quilted, insulated liner with detachable sleeves to convert into a liner vest for a cooler option. The liner is constructed of 100% Polyester ripstop and 100% Polyester Fleece, and uses a polyester insulation.